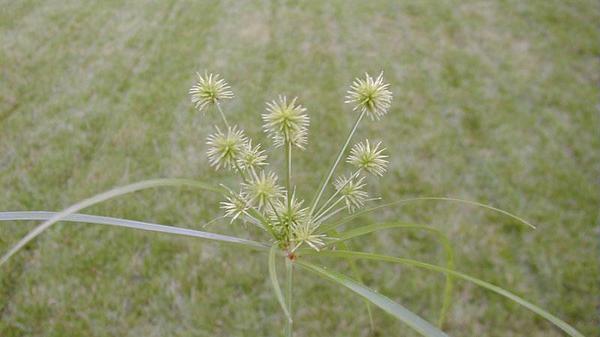 Globe sedge is a perennial weed of turf found in moist and sandy habitats. The seedhead is comprised of several spikelets. Each spikelet consists of a long stalk with a round cluster of seeds perched on the end. Cylindric sedge and globe sedge seedheads are very similar in appearance. 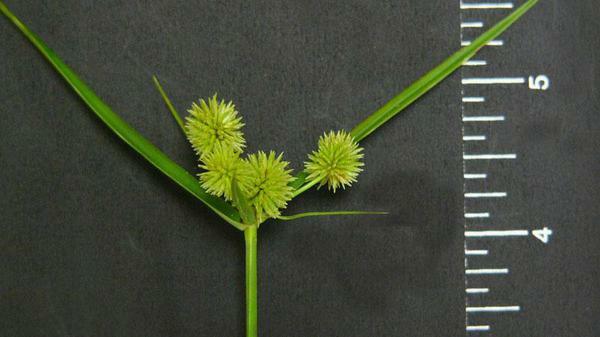 However, globe sedge seedheads are round, whereas cylindric sedge seedheads are oblong. Sedges are weeds that resemble grasses but unlike grasses, sedges have three-sided or triangular stems. It is important to properly distinguish sedges from grasses because management is totally different. 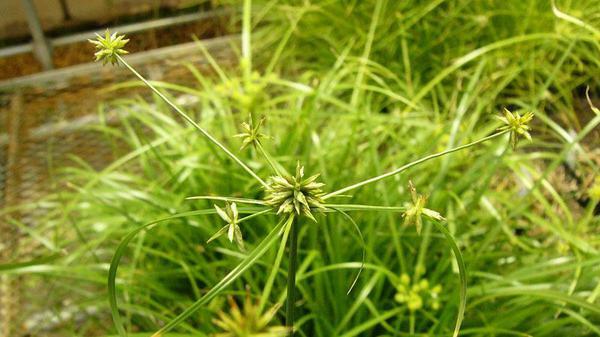 As a general rule, sedges are more of a problem in warmer climates than cooler climates. Proper identification and an understanding of the biology of sedges are necessary for effective management. Sedges are plants that thrive in wet or poorly drained soils but can survive in areas that are not wet. Because of frequent irrigation in highly maintained turf, sedges often thrive in the turfgrass environment. Sedges often become established in wet areas and spread to other areas that are not poorly drained or wet areas. Therefore, it is important to recognize areas where sedges can become established and prevent spread of these sedge species to other areas of the golf course or landscape. As with other perennial sedges, multiple herbicide applications are usually necessary for effective control. Care should be taken to prevent this sedge from producing seedheads because spread of this weed is primarily due to seed dispersal. Figure 1. Globe sedge seedhead. Figure 2. Globe sedge. Figure 3. Globe sedge close-up.